First reviewed in 2010, Well Witched remains the BEST ghost story for kids I have read. Harding is a brilliant, diverse writer and this book will give readers chills and make them think! Well Witched is a remarkable and completely different follow- up to one of my all time favorites, Fly By Night, which Frances Hardinge published as her first novel for children in 2006. Whereas her debut is an alternate-historical fiction work set in a skewed medieval period when guilds controlled society, her new book is a supernatural thriller set in contemporary times. What seems like a typical story of three tweener kids wasting their time over the course of a summer soon turns out to be anything but. Well Witched is a haunting, haunted story of children who make a horrible mistake and find their lives overlapping with some truly sad and disturbed adults. Ryan and Chelle, odd outsiders who are picked on at school, are taken under the wing of the slightly older Josh. He is brash, charismatic and defiant and he protects them from harassment and provides them with a sense of belonging and community. Perhaps because of this, Ryan and Chelle are willing to go along with him at times when they know they are going too far. On a day when they've secretly gone to the neighboring town of Megwhite, a place their parents have warned them to stay away from, Ryan and Chelle follow Josh as he tries to scrounge up change for their bus ride home. When his idea to round up stray shopping carts fails, he decides to pry the grating off an old well and see if he can fish out some money. Unbeknownst to the three kids, the well is the ancestral home of a goddess of water who has been known to grant wishes. When her offerings are stolen, she demands repayment, but not with coins. Ryan, Chelle and Josh all develop supernatural powers and discover that they are now meant to grant the wishes of the people who threw the coins in the well - coins that Josh removed. Ryan, an introvert who wears glasses and likes to look at the world upside down sometimes, develops warts on his hands that sprout lashes and open like eyes, giving him extrasensory vision at times. Chelle, who is timid and colorless and generally ignored even though, or perhaps because, she prattles on endlessly, is given the ability to channel the wishers, audibly and uncontrollably, voicing their thoughts when in close range. Josh develops the ability to corrupt and eventually control electricity and his eyes, hidden by sunglasses, turn into gold coins. The three explore their new abilities and their belief that they must grant wishes, which they do almost recklessly, their schemes working out in the end, but never the way they had planned. Their first "victim" is an angry young man, Will, who wishes he had a Harley Davidson. The three manage to arrange things so that he gets one, but nothing turns out the way they had planned and Will ends up injured and in the hospital, but with a new found (thanks to Chelle) career as a magazine writer. As they seek out wishers and figure out how to grant wishes, the three kids meet increasingly unhappy and sometimes desperate people. The most haunting aspect of the book for me is Hardinge's observation that wishes are a layered thing, like a conker or horse chestnut - a nut with a prickly green exterior hiding the shiny brown nut inside. Wishes, on the outside, represent one tangible thing, but most likely they are hiding a subconscious desire underneath and this is what the children, unknowingly and always dangerously, end up granting. As the story unfolds and Ryan seeks out the history of Megwhite and the well, he discovers disturbing things about the ancient history of the well and a more contemporary story involving three men and a stolen infant. What amazes me most about this novel is the character development and the poetry of the writing, which comes as no surprise, having read Fly By Night, but I am jaw-droppingly thrilled to learn that Hardinge can transfer that skill to such a totally different scenario and story. There is a large cast of interesting adults in this story. Ryan's seemingly indifferent mother is consumed by her drive to write unauthorized biographies of local celebrities - one of whom, a crazy artist with anger management issues, paints their hedge pink and puts voodoo spells on their milk bottles. Ms. Gossamer is a dotty old lady with a troubling past and Carrie is a spurned young woman who literally walls herself up inside of her house with her online purchases. Ryan, Chelle and Josh are the only children in the story, which is a bit odd for a children's book, but works to make the story even more spine tingling and profound, especially since the three children emerge from their experiences physically wounded but emotionally stronger and more sure of themselves and the adults around them. This is a book that I will think of from time to time and reread often. The images, people and plot are sticking with me, like a good movie. And, like Harry Potter and many other great books, I think this book can be read on a few different levels. Younger readers will read for the plot, older readers will pick up on the emotional subtleties as well as the plot. And anyone who likes a good ghost story and/or mystery will love it. And anyone who loves well written words and beautifully crafted imagery will treasure it. Look for a new book from Hardinge sometime late in 2009. 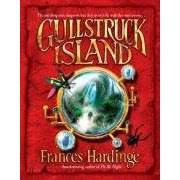 Gullstruck Island will be published in England in January of 2009. Hardinge gives a brief description of it in the extras included in the paperback edition of Fly By Night. Great review! I love how insightful and penetrating Hardinge's character studies are - and yet she doesn't hammer us over the head. You're right that some readers will zip right past the sublties in order to relish the action; those readers who are older and more careful will be richly rewarded. I'm so glad to know that someone has read Frances Hardinge and like her work! If you ever read "Fly By Night," please comment, especially if you know any children who have read it. She has a new one coming out in England called "Gullstruck Island" that sounds totally different from her first two (again!) I just might have to break down and pay to have it shipped from England since there is not pub date for the US yet... Thanks for your kind words! I did not enjoy this one as much as Fly by Night, but that doesn't mean it wasn't good. I felt the plot was well crafted and the characters, while primarily unlikeable, were well done. I really look forward to more books from her. You are so right - the characters were all pretty unlikable. Funny. How do you have time to read all these books?!? I'm glad you do - thanks for your comments. It's good to know I'm not reading in a vacuum!